A rather logical combination of heating method and control is radiant heat with an IRt/c for control. They work extraordinarily well together, since both theheating and measuring occur right at the surface, where the paint is located. The IRt/c reading is unaffected by reflections from the heater, since the spectral response of the 6-14 micron IRt/c lens filters out the shorter wavelengths of the radiant heater energy. The IRt/c may be mounted in the shroud or reflector of the radiant heater, such that it can see through the elements. Select any of the IRt/c models, depending on the field-of-view required to see past the elements to the painted surface. Test the location by turning on the heater with no target present. The change in reading should be small. Care should be taken in mounting the IRt/c in such a way as to keep its temperature below 200°F (93°C) and to keep the lens clean. 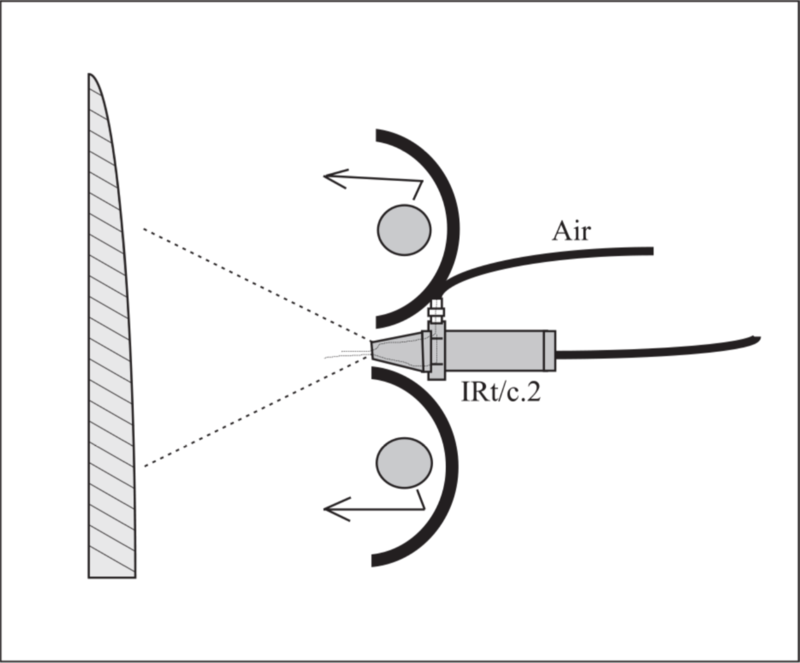 The IRt/c.3x, .5, and .10 are the preferred models for this application because of their built-in air purge. They can be used in environments with temperatures up to 250°F (121°C) or higher when the air purge system is used. The narrow fields-of-view allow more leeway in positioning, and thus more flexibility in installation.